Exquisite Craftsmanship. Advanced Technology. Outstanding Customer Service. 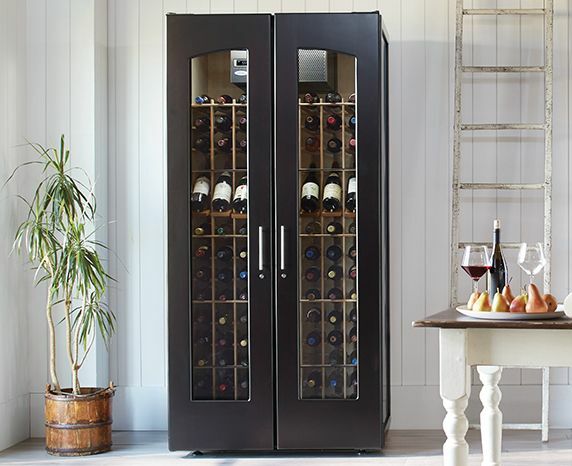 At Le Cache, we create refrigerated wine cabinets that are both quality furniture and dependable wine storage solutions. We work with acclaimed furniture designers to build cabinets that will fit beautifully in almost any home décor. Each cabinet also comes outfitted with a CellarPro cooling unit, proven to maintain ideal temperature and humidity conditions for long-term storage and aging of fine wine. Our customers often tell us that photographs don't do justice to the workmanship of our cabinets. One client described his Le Cache cabinet as "a piece of art that has exceeded my expectations." We hope that you'll feel the same way. And, if you're not completely satisfied, you can return it for a refund within 30 days. What makes Le Cache wine cabinets special? 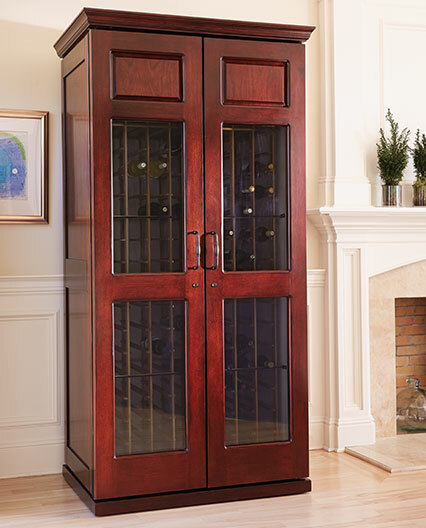 Made from premium hardwoods, our cabinets will age gracefully over years and even decades—like the wines they protect. Finished with a beautiful Cherry wood veneer, offered in a choice of hand-stained finishes to complement the decor of your home or business. Hand-carved details and architectural features, like crown and base moldings and side paneling, give our cabinets an old-world majesty. Substantial pulls and metal accents, made from hand-turned pewter and stainless steel, enhance the overall aesthetic of the cabinet. UV-resistant, double-paned tinted glass doors display your bottles while shielding them from damaging sunlight. High-density foam insulation seals your collection against external heat and helps maintain proper wine storage conditions. Discover more about our cabinets' quality design points. All Le Cache Cabinets include a choice of CellarPro 1800 cooling units, which provide optimal wine storage temperatures and humidity conditions with digital precision. When tested in 85°F and higher environments, our cooling units maintained a tight temperature range between 55° and 60°F. Adjustable humidity control lets you specify the amount of moisture recirculated inside your cabinet to ensure a recommended 60% relative humidity. You can choose the 1800 model that is best sized to fit a cabinet and the environment where it will be located. Fans operate quietly (emitting less than 50 decibels of noise) and keep temperatures consistent in all parts of your cabinet. Extra-large coils are Electrofin-coated to resist leaks and corrosion. We inspect and bench-test every unit before it leaves our factory. Our units are designed and made in the USA at our headquarters in Petaluma, California. Discover more advantages of our cooling units. Our cabinets come with all-wood universal racking that safely cradles bottles of many sizes. Generous 3.75" slots fit both standard Bordeaux bottles and oversized Burgundy and Champagne bottles. Finished wood racking prevents the scratches and label damage that metal racks often cause. Unlike metal racking, sturdy wood racks won't buckle under the bottles' weight. Read our wine racking FAQ. We cover our cabinets and their cooling systems with a thorough warranty, covering both parts and labor in case of repair. 5-year warranty for cooling units. If your cooling unit needs a repair, we'll ship you a replacement cooling unit, so that your collection isn't exposed to the elements. Support and troubleshooting advice are always just a phone call away; you'll speak with an expert Le Cache employee, not an anonymous rep at a call center. Learn more about our service and support policies. Any questions about our cabinets? Please call us toll-free at 1.877.532.2243. You're also welcome use our contact form or chat live with one of our knowledgeable reps. We'll be glad to hear from you!